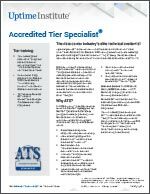 Abstract - Accredited Tier Specialist (ATS) is intended for data center managers and the outside resources that support them. This course is 3 days of intensive instruction, concluding with an examination. ATS awardees will be better equipped to manage the data center to perform over the long term, communicate the ongoing and evolving needs of the data center to decision makers, and positively influence the decisions for future investment.